One Book One Twitter starts tomorrow. Here's a Guardian Article about it. Tell people about it. If you're on Twitter, follow @1b1t2010, and bust out your copy of American Gods. Remember that http://frowl.org/gods is an excellent round up or starting place for American Gods gods and geography. And remember that, as with any of these city-wide book clubs, there are no rules. One Book One Twitter starts tomorrow but you can start reading whenever you like, jump in and out of conversations as you wish. I'll try and respond to questions. I may try and do occasional "Okay, I'll answer all the #1b#t questions that come in starting now..."
...I'm in Cologne, right now as I type this. So, in the blog before last, I went to Indianapolis and got the Kurt Vonnegut Jr prize for Literature. Then I got up very early and flew to Chicago. 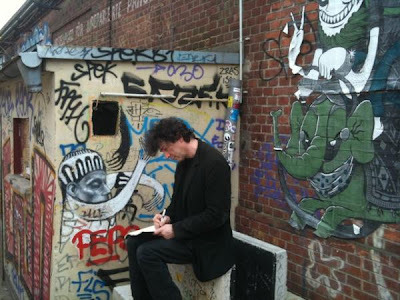 There was a convention going on in Chicago, C2E2, and I'd been asked to do the first Comic Book Legal Defense Fund Evening With Neil Gaiman since the end of the Last Angel Tour a decade ago. And I did. It was a strange, long day -- people had paid up to $250 for tickets (they were the "dream tickets" that the CBLDF sold, and those people also got a signing), and there were about 1600 people in the audience altogether. I had to sign a few thousand things for the CBLDF, the coolest of which were the "In Reilig Oran" prints that Tony Harris painted. I did a bunch of TV interviews (looking a bit more tired and frayed than normal) on subjects ranging from Freedom of Speech to Online Privacy. Choose Privacy Week Video from 20K Films on Vimeo. I read stories. I read poems. We had an intermission. I answered questions. I read some more. I said goodnight, over an hour after it was meant to have ended. It was good, and although it had a long way to go before it was smooth, it had raised many tens of thousands of dollars for the CBLDF. And that was good. Here's Cat Mihos, who helped me, blogging about it; and here's Valya Lupescu blogging about it all. Or that I have to get back to Chicago in the next month or so in order to catch this: http://chicago.timeout.com/articles/theater/85389/neil-gaimans-neverwhere-at-lifeline-theatre-and-other-fantasy-and-science-fiction-stage-adaptations? Up too early again, and I flew to Minneapolis where Cat and I were met by Lorraine and two dogs, and she drove us to Stillwater. This is me in Berlin a few days ago, writing during a little downtime. Not really sure what's happening with the hair. I loved the Stillwater talk, from the High School Auditorium. It was broadcast on Minnesota Public Radio in its entirety (except for the audience Q&A afterwards), and can be heard by clicking on the widget on that page, or on this one. It was funded by the state of Minnesota Taxpayers, from a sales tax. Oops. About to lose wireless connection. I'll post this now and continue later. From Prague, I think. (But before I go, I've been pushed this a while ago, and its time is nearly up: it's the Kickstarter link for a film called The Rainbow Boy. They have $6000 to raise in 6 days to complete Principal Photography. They've already raised $9000. The Rainbow Boy cast is composed entirely of Navajo people, many of whom had never acted before. It includes approximately 60 Navajo youth under the age of 25 as actors, extras, and crew members. The majority of the principle photography was completed in November of 2009, as was the editing of the promotional teaser/trailer.